Since the mid-nineteenth century, Cuban popular music has played an important role in urban western culture. From the habaneras danced in the salons of New York City in the 1860s to the congas, rumbas, cha-chas, son-montunos and mambos of more recent vintage, Cuban dance has exerted a powerful international influence. ” Most of Cuba’s culture, including its dances, resulted from what Fernando Ortiz termed “Cuban counterpoint,”, the balance of Cuba’s Iberian and African components. One of the best examples is that of “son-montuno.” Depending on where one lived in Cuba, the main cultural influence on music and social activities was either Spanish or West/Central African. In those regions where tobacco was grown, many of the farmers were from Spain or the Canary Islands. Whereas, in the sugar cane growing regions, many workers were slaves brought from West and Central Africa in the mid 1800s. their (the dancer’s) heads”. The Ejagham men formed secret societies, Abakua’, whose members danced in secret society rites or carnival parades. The members wore masks, “i’remes” (or “diablitos”, little devil in Spanish), representing ancestral figures. The Kongo-Angolans brought their music and dance, profoundly impacting Cuban culture. Their non-ritual celebrations, “congueri’as”, featured their “makuta” and “yuka” dances. The yuka, similar to the modern rumba, is composed of the “ronquido” and the “campanero”. The former is a series of lateral steps, while the latter’s steps form a figure-eight pattern. The dancers also performed a Kongo ritual combat dance, the “mani'”, similar to the Brazilian “capoeira” and congueri’as. The “yambu'”, “guaguanco'” and the “columbia”, all imitative dances, collectively form the “rumba” and are related to older Kongo forms. The second, the vacunao, symbolizes his conquest of her. Although the vacunao is similar to the “zapateo”, a European couples dance, and the “umbigada”, another pelvic thrust in early Angolan influenced samba dances, it is clearly from the Kongo dance styles. The columbia, started in rural areas, is a male solo dance featuring acrobatic and mimetic forms, making it the most complex of all the rumbas. The dancer may imitate a ball player, bicyclist, cane-cutter or cripple or perform some of the Abakua’n ireme’ steps. The dancer and the main drummer challenge each other throughout the dance. “Comparsas”, on the other hand, are collective street rumba dances. Neighborhoods would form a comparsa and perform in carnivals and other occasions. The dance is similar to the Brazilian samba using dramatic or allegorical themes. The “conga” is a simpler form of the rumba made popular in the United States in the late 1930s.”Cuba’s two most important dances, the “danzo’n” and the “son-montuno”, emerged from radically different social environments. Both changed dramatically as they moved from eastern to western Cuba, from a more Iberian zone to a more Afro-Cuban one.” The danzo’n, descendant from the French “contredanse,” was brought to Cuba by French planters fleeing Haiti in the late 1700s and eventually evolved in the mid 1800s into the simpler “danza” or “habanera. “In the late 1870s, the danza evolved into the danzo’n and is now considered the national dance of Cuba. Until the late 1920s, the danzo’n was limited to the upper classes at their private clubs and societies. Then, the danzo’n incorporated a more syncopated final section. In 1938, Antonio Arcano created the “mambo” a new rhythm danzo’n composed of a more swinging, riff-based section played by the charanga orchestras of flute and violins. Soon, the black and working-class Cubans began dancing the mambo. Pe’rez Prado in Mexico and Machito in New York City popularized the mambo in their big bands. The “cha-cha” evolved from the mambo, and thus is also a descendent of the contredanse. The son-montuno started as a couples dance in Oriente, a Cuban province. The accompanists were typically composed of Spanish-based folk guitarists and Afro-Cuban percussionists. As it moved westward to Havana, the music and dance styles grew and evolved with more percussion, especially in the final montuno section. It became very popular in the 1930s, often mistakenly called the rumba. Its Spanish and African musical elements form the basis of today’s salsa as well as urban dance music around the world, including French-speaking areas of West and Central Africa and the Caribbean, and Colombia, Venezuela, and Ecuador. “Cuban “son” music is to salsa as roots are to a tree. Salsa has many roots, but the style that gave rise to and shaped it more than any other is the son. The son is the most important and influential music to have evolved in 20th Century Cuba. Armando Sa’nchez, leader of Conjunto Son de la Loma, states that the son “is a people’s music-a true expression of the Cuban people’s history and life.” This music, more than any other, expresses and identifies the ethos of the Cuban people.”Son originated in the 1800’s in the mount ains of Oriente, a Cuban province. It evolved from the “changui'”, a form of music rooted in African music brought to Cuba by the African slaves in the early 1900’s and carried on by their descendants. As the Africans moved to Havana, the son became a popular music style of the working class. Musicians began to incorporate African and Spanish music styles, such as the rumba and the music of “santeri’a,” “decima” and “guajira.” By the 1920’s, son was the most popular music and dance for Cubans at all levels of society. By synthesizing African and Spanish music styles and appealing to all Cubans, son essentially became Cuba’s national music. We had to accept their standards and “whiten up” the music.” Two of the most typical “conjuntos” (ensembles) at this were Sexteto Habanero and Septeto Nacional By 1918, Sexteto Habanero developed the “son conjunto” sound: three voices, string bass, “tres” (6 or 9 string guitar), maracas, bongos, claves (wooden sticks struck together for the time-line rhythm), trumpet, and guitar. In the late 20′, Septeto Nacional expanded the son style, by using tighter vocal harmonies, rhythmic complexity, and a faster tempo. This faster, more complex style became internationally popular. However, in the late 30’s, Arsenio Rodri’guez (one of Cuba’s greatest musician and composer) began reconnecting son with its African roots. “Arsenio brought us back to our roots, and in doing that, he moved us forward,” states Sa’nchez. Through his many innovations in style and instrumentation, Rodri’guez expanded the son sound to emphasize or re-incorporate many of the African elements which many of the earlier son conjuntos omitted or simplified. He synthesized and maintained the integrity of African and Spanish elements.Some of his innovations were 1) adapting the guaguanco’ to the son style; 2) adding a cowbell and conga to the rhythm section; 3) expanding the role of the tres as a solo instrument, and 4) introducing a “montuno” (or mambo) section for melodic solos. Arsenio’s songs made philosophical statements about Cuba, community life, and ethnic pride. His style became known as “son montuno” and formed the basis of the mambo craze in the 40’s, influencing Latin popular music in New York for years to follow. By the 30’s, the popularity of son and mambo spread to Puerto Rico where musicians incorporated the style with their own. As Cuban and Puerto Rican musicians emigrated to the US, especially New York, they took that style with them, forming Cuban/Puerto Rican son conjuntos. “Since the 1960’s Arsenio’s sones and his conjunto sound have been reinterpreted by salsa musicians. contemporary Latin pop music. It connotes a feeling as well as a variety of redefined/reinterpreted styles and traditions. African-American big-band jazz stimulated the formation of Latin big-bands in the late 40’s. Cubans, Puerto Ricans, and African-Americans joined to play a style which integrated the compositional concepts of the big-band horn sections with the Afro-Cuban rhythm sections, eventually evolving into the New York Latin sound, mostly played by Puerto Ricans. Big band leaders, such as Puerto Rico’s Tito Puente and Tito Rodriguez and Cuba’s Machito, expanded the mambo section of the son, creating its own style and form, the first major “cross-over” from Afro-Carribbean music. The cha-cha-cha and the mambo, both internationally popular, were also incorporated into this style, forming the foundation for “salsa.” Until the US severed diplomatic relations with Cuba in 1962, the New York and Cuban musicians continually interacted, forming parallel Latin music styles. After 1962, New York-based music began incorporating the inspiration of the world around them, forming a distinctively New York style. 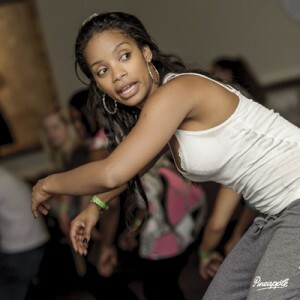 One result of the Latino and Black communities interaction was Latin “bugalu”, adapted from the popular African-American dance of the mid 60’s. Latin bugalu used the standard Latin musical instruments, added a set of trap drums, and had lyrics sung in Spanish and English. Another result of the interaction was the incorporation of the cumbia, merengue, and bomba, plena, “jibaro” (from the mountains) music styles from Columbian, Dominican, and other Puerto Rican peoples living in New York.